1.2 Where to find eucalyptus trees? 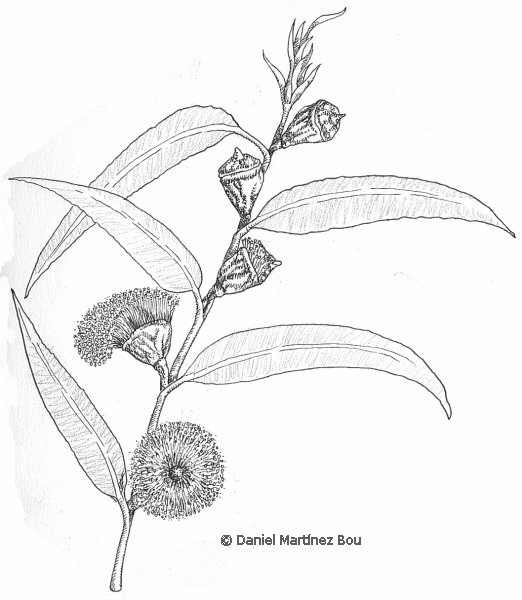 Scientific name: Eucalyptus globulus Labill. Where to find eucalyptus trees? Habitat: Eucalyptus is a plant native of Australia and Tasmania, where you can find over 300 species of Eucalyptus. Due to its growth speed, it can be found cultivated in many regions of the world for its wood, for paper pulp, and essential oil collection. It has been especially used to clean up wetlands to remove moisture from them with the consequent elimination of insect pests, especially mosquitoes, and the diseases they transmit. Its use has been a great aid for malaria control in many areas in Asia, South America and southern Europe. On the other hand, this capacity to absorb water, makes eucalyptus a species very aggressive to the environment by transforming ecosystems by drying the soil where they are planted. Perennial tree of the myrtle family of 40 to 65 m in height. Erect stems with bark of bluish gray. Adult leaves alternate, lanceolate, up to 30 cm long, petiolate, with very strong midrib, dark green, shiny, hardened texture. Young leaves petiolated, not embracing the stem, gray-green and opposite. Flowers: solitary or 3 together in umbels with numerous very prominent stamens and no petals. Woody fruit capsule up to 2.5 cm in length, with up to 4 cells that contain a large number of seeds. Eucalyptus essential oil (13.5%): cineol or eucalyptol (7085%), alphapinene, dlimonene, pcymene, alphaphellandrene, camphene, gammaterpineol. Sesquiterpenes: aromadendreno, globulol, ledol, viridiflorol. Acids: chlorogenic, ellagic (bark) caffeic, ellagic, ferulic, gallic, gentisic (leaves). 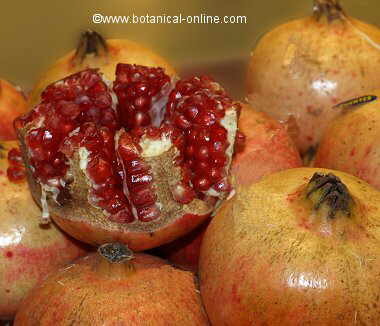 Flavonoids: eucaliptina, hyperoside, quercetin, quercitrin, rutin. 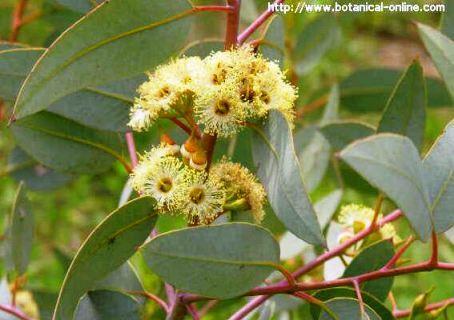 The introduction of the eucalyptus as a medicinal plant in Western herbal medicine is fairly recent. It begins to be used from the eighteenth century, therefore, being a tree from other latitudes, its properties were known when cultivation was implanted in other areas far from its natural habitat. From then until now, eucalyptus has been considered as one of the best plants for the treatment of diseases of the respiratory system. Ingested eucalyptus products are excreted through the respiratory tract which, when dissolved in them, exert their medicinal properties. Antimicrobial Properties: It is able to eliminate the microorganisms causing diseases (bacterial properties to remove bacteria, bacteriostatic properties to inhibit the growth of bacteria, and fungicide properties to eliminate fungi). It has been found that the application of essential oil on cultures of microorganisms as important as Staphylococci, Candida, Mycobacterium tuberculosis, rabies virus, prevents the growth of germs or removes them. There have been experiments on how eucalyptus oil emanations are capable of removing up to 70% of Staphylococci present in a closed room. In fact this oil is used in some poor countries as a means to disinfect air. These are the reasons why it has been used in wetland areas to combat ague or purify the air in areas affected by cholera. The main component that gives it such properties is cineole, also known as eucalyptol, which is at the same time, the most abundant component of essential oil, and which gives its antiseptic properties. 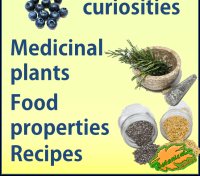 Also other components can contribute to the same properties (pinene, alpha pinene, limonene, caffeic and chlorogenic acids, linalool, geraniol, thymol, quercetin, etc). 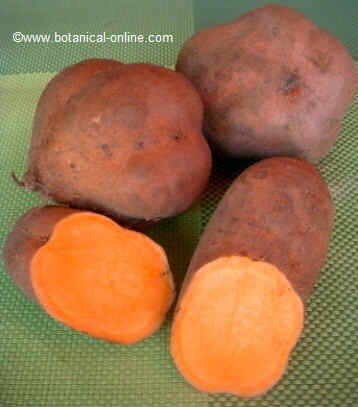 Its richness in tannins (gallic acid) and flavonoids (quercetin, quercetin) are responsible for its bacteriostatic properties. Expectorant properties: That are capable of producing sputum, that’s to say, to remove excess mucus in the airways. Again, eucalyptol, camphene, pinene, limonene, thymol and geraniol cause the expulsion of mucus. 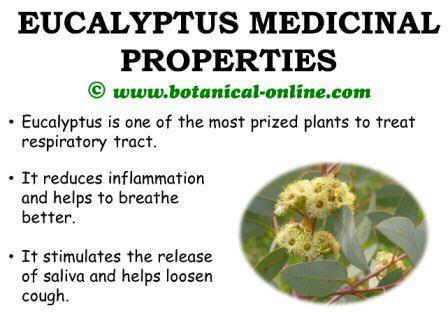 Antiinflammatory properties: Eucalyptus reduces inflammation and allow for better breathing. 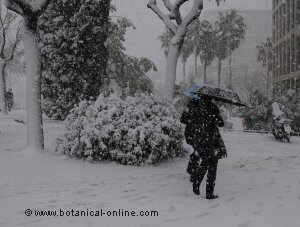 In this case, eucalyptol and thymol, with their acids and flavonoids, give this property to eucalyptus. In case of inflammation of the nasal passages, it appears that these components open them (after a period of nasal narrowing) by stimulation of the hairs that line the nasal passages. This frees nasal passages of excess of mucus. Tonsillitis: In case of a sore throat, gargling made with the liquid from the decoction of a handful of leaves in a liter of water helps reduce swelling of the tonsils, reduce itching and eliminate the infection. Pharyngitis: It soothes the throat and helps kill germs that cause inflammation. (Decoction of a handful of leaves per liter of water. Aspirate vapors covering the head with a cloth) (infusion of slightly more than half tablespoon of dried leaves per cup of water. Take 3 cups a day) The same treatment can be applied in case of laryngitis or inflammation of the larynx. Cold: It helps fight colds, reduces symptoms of this disease, diminishing inflammation, reducing cough, helping to eliminate excess mucus, soothing the throat, etc. 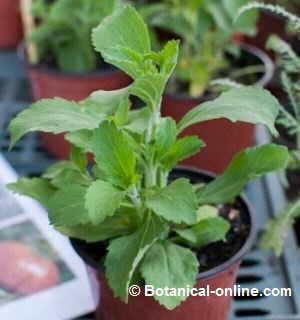 Tuberculosis: in fresh or dried leaves, but it can also be used in the form of essential oil. It has antiseptic, balsamic, decongestant, respiratory stimulant and expectorant properties. 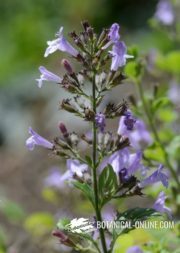 It Is indicated for infectious respiratory affectations, such as tuberculosis as well as for inflammatory affectations, such as bronchitis. We can take it in the morning, afternoon and evening (Half a teaspoon of leaves (let stand 15 minutes) and you can add the juice of a lemon and a little honey. You can also inhale to clear the congestion. Eucalyptus possesses hypoglycemic properties, That’s to say, it decreases levels of blood sugar. It may be useful for the treatment of diabetes by helping the person with diabetes to control blood sugar level or prevent the onset of this disease. Herpes: For the treatment of herpes simplex and genital sores, you can use the essential oil diluted in water according to the previous form. Acne: This same treatment can be very useful in the treatment of acne, being able to reduce blackheads, pimples, or papules. Gingivitis: for the treatment of inflammation of the gums, eucalyptus oil can be quite effective. Wet your finger with a few drops of essential oil and rub down your gums. Do not swallow the liquid. 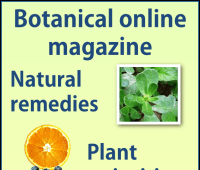 Note: Similar effects to those produced by the essential oil can be achieved if a few crushed leaves of this plant are placed as a poultice on the affected skin. When using essential oils, one should not forget to dilute them with water or alcohol or other vegetable oil, such as olive or almond. The pure use of eucalyptus oil on the skin can damage it. Osteoarthritis: The same preparation can be used for the same purpose in cases of wear of the cartilage of joints, especially the spine, hips, hands and feet. Muscle pain: Rubbing with the essential oil on the sore muscles, sprains or tears would help reduce inflammation and bring down pain by preventing spasms. Cosmetics: Eucalyptol is extensively used in the cosmetic industry for its many properties. Besides being a good antiseptic and a great cicatrizant for the skin, it contains very aromatic principles which determines its presence in the composition of many products such as shampoos for dandruff, toothpastes, soaps, ointments, lotions, air fresheners, etc. Chemical Industry: Its ability to kill or repel insects and microorganisms makes it present in many chemical preparations as insecticides, fungicides, insect and pest repellents. The use of preparations with eucalyptus, even at recommended doses, can cause adverse reactions in some people that are manifested as diarrhea, nausea or vomiting. Externally, the use of this plant can cause allergic reactions in the form of dermatitis. It is appropriate to initiate treatment with small doses to see any individual responses, either in topical application, internal applications or vapors.